Blackhawk 60MP03BK M-7 Medical Pack with HydraStorm 100oz Water Reservoir FREE SHIPPING! The BlackHawk M7 is a small, compact Medical Pack designed for easy deployment and carry. Can be worn as a back pack or used as a carry bag. Great for medical gear, travel gear and anything needing separate compartments. The M7 is great for your vehicle, boat, humvee and operators. Two large covered pockets on sides contoured for holding oxygen cylinders, IV bags, etc. 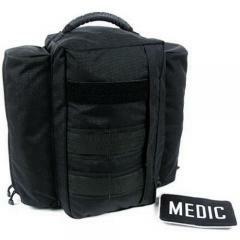 ©2002-2019 CopsPlus.com: Blackhawk 60MP03BK M-7 Medical Pack with HydraStorm 100oz Water Reservoir FREE SHIPPING!